WASHINGTON — No more staying up late during the week. Farewell to sleeping in. And hello, homework! 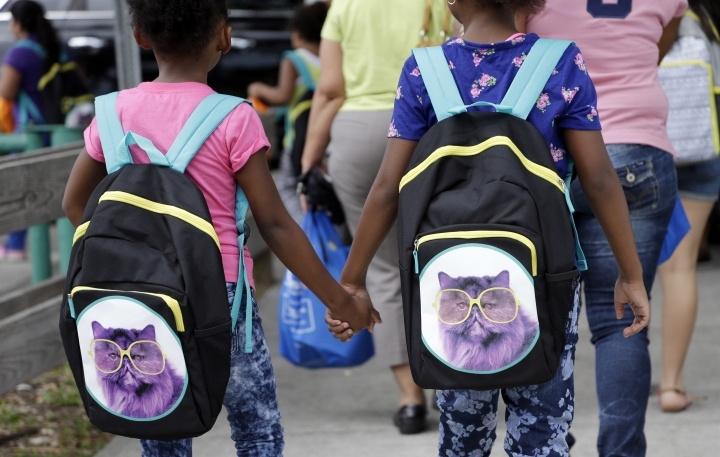 The lazy days of summer are ending for millions of children as they grab their backpacks, pencils and notebooks and return to the classroom for a new school year. About 50 million students are expected to attend public elementary and secondary schools this fall. That's up just slightly from the 2015-16 school year, according to the Education Department. They'll be taught by some 3.1 million school teachers from pre-kindergarten through high school, with an average student-to-teacher ratio of about 16 students to each teacher. Around 249,000 teachers are new hires this school year. The growth of charter schools is continuing, with enrollment increasing from 800,000 in 2003 to 2.5 million in 2013, according to government figures. Some 40 states and the District of Columbia reported having about 6,400 charter schools. The U.S. spends about $11,670 per pupil, on average, on public school education. About 4.8 million students are expected to attend private school this fall, down slightly from the previous school year. The National Center for Education Statistics estimates that 3.5 million students, both public and private, will graduate from high school at the end of the school year. Some schools are adding to the traditional 180-day year. 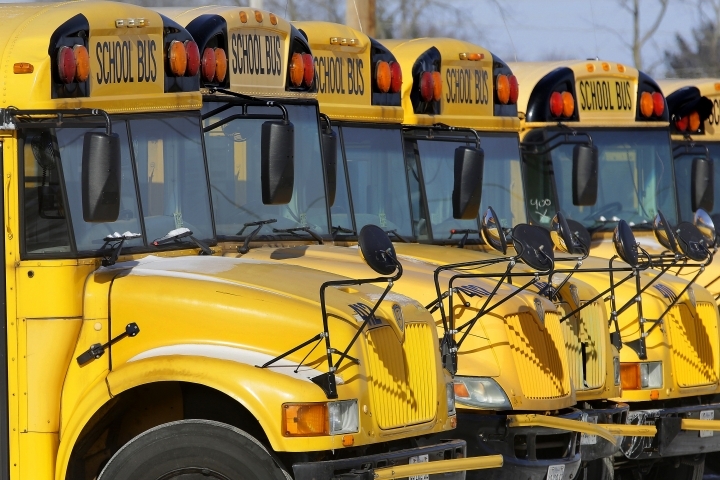 In Washington, D.C., for example, 10 public schools are moving to extended-year schedules. Students in those schools will have 20 more days per year than peers at other schools. They'll have shorter breaks over the school year, which will run 200 days through all 12 months. The idea is less time away from school in the summer will help boost learning and achievement. The cost of college continues to rise. Undergraduate tuition, fees, room, and board were estimated at $15,640 at public institutions, $40,614 at private nonprofit institutions, and $23,135 at private for-profit institutions for the 2013-14 school year. In the last 10 years, prices increased 34 percent at public institutions and 25 percent for private nonprofits. In all, 40 percent of 18- to 24-year-olds were enrolled in college or graduate school in 2014, according to Census Bureau numbers. The latest results from national math and reading tests show slipping or stagnant scores. Math scores were down for fourth and eighth graders over the last two years. It was the first decline since 1990. Reading grades were flat for fourth graders and lower for eighth graders, according to results from the National Assessment of Educational Progress. Globally, American students trail their counterparts in Japan, Korea, Canada, Germany, France and more. In reading, the U.S. ranks No. 16 in a global test given to 15-year-olds. Scores were worse for math, with the U.S. ranked 30th against students from other countries taking the Program for International Student Assessment, or PISA tests. 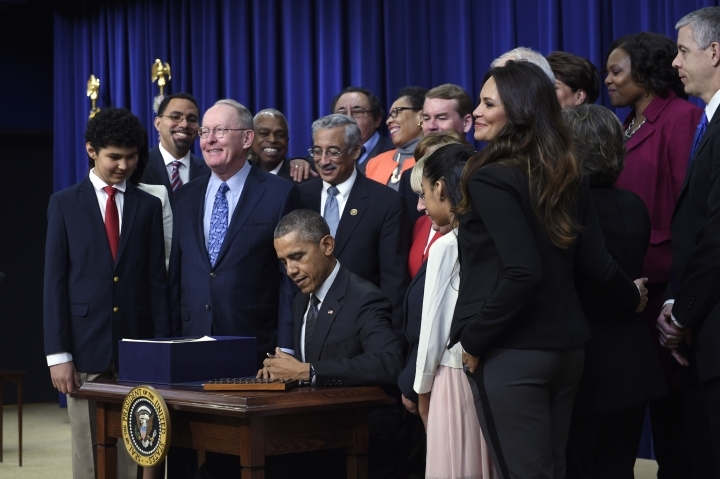 The nation's schools districts are working with states and the federal government as they implement a new education law passed last December that returns to the states significant control over education policy. But the Education Department still plays an oversight role for the nation's 100,000 or so public schools. States and schools are busy developing new accountability systems — a key component of the Every Student Succeeds Act. The law allows states and districts to design their own measures of achievement and progress, and decide independently how to turn around struggling schools. And while students still have to take federally mandated reading and math tests, the law encourages states to cap the amount of time students spend on standardized testing each school year. The Obama administration has recommended that districts cap the percentage of classroom time students spend taking required statewide standardized tests at no more than 2 percent. The Council of the Great City Schools says testing amounts to about 2.3 percent of classroom time for the average eighth-grader in public school. Back-to-school supply costs are expected to decrease this year, but they'll be offset by higher fees for after-school activities such as sports, according to the latest Backpack Index by Huntington Bank. The index measures the cost of supplies and extracurricular activities. —$659 for an elementary school child, a 1.5 percent increase compared to last year. —$957 for a middle school student, a 1.6 percent increase. —$1.498 for a high school student, a 6.8 percent increase. The report says higher fees for sports participation, especially in high school, are responsible for much of the increase.